The definition of the perfect sandwich will vary from person to person and can be the topic of interest among all ages. Hours could be spent debating the art of sandwich making; everyone having their own twist on their favorite. Often when we are at a loss as to what to fix for a meal someone will propose that we have sandwiches. Generally, someone seconds the motion and then the debate begins as to what kind of sandwiches should we fix? When it comes to what you put between two pieces of bread there are few rules. And, a sandwich can be eaten any time of day. Hence, we even have the breakfast sandwich. There is a smorgasbord of possible sandwich fixings, the beauty of which, after you lay out the sandwich supplies, everyone builds their own. Sandwiches, according to legend, were invented by the Fourth Earl of Sandwich. I am assuming that he was Earl of the Sandwich Islands. According to legend, he was apparently hungry but did not want to break away from his card game. He told his butler to put some meat between two pieces of bread so he could continue his gambling and keep the cards clean. I am sure that throughout history there were others who were sure that they had already invented the first sandwich and just didn�t get credited for it. One thing for sure, sandwiches are constantly being invented and re-invented. Even the pickiest of eaters loves something on bread. The most popular sandwich in the United States is the peanut butter and jam sandwich or �PBJ� for short. Our family often refers to a PBJ as a �stirred sandwich� because of the technique we use in making it. Take equal parts of peanut butter and jam and mix them together in a small bowl before spreading the mixture on the bread. This process keeps the jam from soaking into the bread. Another family favorite of ours is a grilled peanut butter and banana sandwich. This actually was one of Elvis Presley�s favorites. You smash a ripe banana and mix it with peanut butter. Spread the mixture on soft white bread. Butter the outside pieces of the bread and grill in a frying pan until golden brown. If you want to really get carried away sprinkle the grilled sandwich with cinnamon sugar. 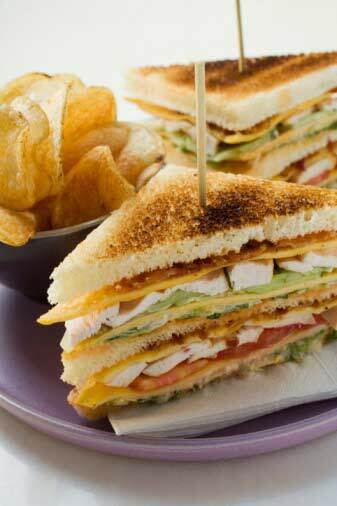 Sandwiches can be plain or gourmet, but one thing is for sure it�s an easy and delicious meal. 1 pound salmon skinned and cut into portions. Rub 2 Teaspoons blackened or Cajun seasoning on the Salmon. Rub the Cajun seasoning on both sides of salmon. Grill 3 � 4 minutes on each side. Mash an avocado with 2 Tablespoons of low fat Mayonnaise in a bowl and a teaspoon of fresh lemon or lime juice and a dash of salt. Spread the mixture on a Kaiser roll with a portion of the salmon. 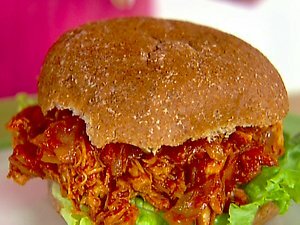 This sandwich is also good with a little tomato and onion. Season the chicken with salt and pepper and place in a heavy pot with onion, garlic and just enough water to cover the chicken (about 1 1/2cups). Add the BBQ sauce, vinegar and a few drops of hot sauce and bring to a boil. Reduce the heat and simmer until the chicken is cooked through, about 15 minutes. Remove the chicken from the sauce and shred. Boil the sauce, skimming occasionally, until reduced by half (about 15 minutes) and season with salt and pepper. Add the shredded chicken to the reduced sauce and heat through. Spoon the mixture onto the rolls and top with cheese.